When I first had the idea for this cartoon, I figured the contrast it drew between House Democrats’ attitudes towards recently-elected NY Representative Alexandria Ocasio-Cortez and returning Iowa Republican Steve King might have been a bit too exaggerated and unfair. After all, just because Congressional Democrats had tolerated King’s openly-racist presence for nine terms doesn’t mean they liked sharing the chamber with him, and since he’s a member of the GOP, it wasn’t like Democrats were responsible for his behavior, either. …but then they reminded me that we’re living in a post-satire era by going out of their way to prevent King from being censured by the House for statements he’d recently made in support of white nationalism. 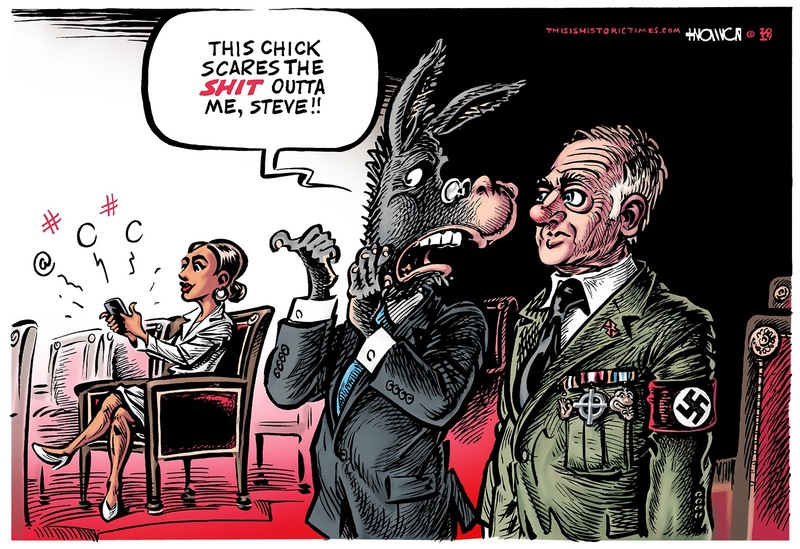 At the same time, Congressional Dems have expressed fear of and scorn for Ocasio, who ousted 10-term incumbent company man Joe Crowley in 2018 to ultimately become the youngest woman ever elected to Congress. Ocasio commands a significant media platform thanks to the upset nature of her election, her savvy Twitter presence, and her charming personality. She also seems determined to actually do some of the things she ran on, instead of merely deferring action until we all burn to death. To some, this is apparently a bigger no-no than endorsements of white supremacy. This entry was posted on Sunday, January 27th, 2019 at 12:19 am	and is filed under Cartoons & Commentary. You can follow any responses to this entry through the RSS 2.0 feed. You can leave a response, or trackback from your own site.